Welcome to The Catamaran Hotel, located directly on the beachfront in Falmouth Harbour in the south of the stunning Caribbean island of Antigua. For 10 nights only this beautiful colonial style hotel becomes a ClubSolos property. Come and join us for an authentic Caribbean experience! Originally conceived by renowned Antiguan Yachtsman Sir Hugh Bailey in 1968, this small hotel is now lovingly cared for by his daughter Feona and her son Colin, offering a warm welcoming atmosphere with emphasis on friendly and hospitable service. The property is ideally located on the quiet waters of Falmouth Harbour, on the south of the island, near historic Nelson’s Dockyard. If you prefer a large All Inclusive resort, The Catamaran Hotel is not for you. However, if a small colonial style beachfront hotel is your idea of paradise, then this little gem is the perfect choice to get away from the hectic pace of everyday life. For 10 nights this family run hotel is exclusive to ClubSolos guests and offers the same personalised service that can be found at all of our other ClubSolos properties. Feona, Colin and other dedicated staff will be on hand at all times to ensure that we are all having a memorable time. The hotel boasts a private swimming pool offering stunning views of the ocean. Here we can grab a sun lounger, a drink from the hotel bar and relax and unwind for the rest of the day. A few steps from the pool is the small beach. None of the beaches in Antigua are private however, it is rare for anyone other than hotel guests to use the beach. Although there are no organised beach activities here, yachting, diving and hiring of sunfish dinghies and rowing boats are all available through the hotel reception. In the evenings we will all dine together at the hotel’s Captain Quarter’s Restaurant & Bar offering waterfront alfresco dining. With an unrivalled view of Catamaran Marina and Falmouth Bay, the setting is perfect for breakfast each morning and our ten included themed night dinners. We will enjoy everything from a traditional Antiguan coal pot cooking night to Jerk Night - all served up with a different form of entertainment each evening. There are five room categories at the hotel. Although they all offer the same facilities, the sizes, décor and views differ, and this is reflected in our varying room prices. The Standard Rooms are the smallest rooms in the hotel and offer all the basic amenities needed for a comfortable stay. As these rooms do not have a terrace or balcony, a small table and chairs will be set out in the courtyard so that we can enjoy views of the ocean. The Beachfront Rooms are on the ground floor and have a shared terrace. These rooms are just a few steps from the hotel’s small beach. The Superior View Suites are on the first floor of the hotel and offer breathtaking panoramic views of Falmouth Bay and the beach from the private balcony. The Captain’s Cabin are individual units set apart from the main building. These rooms offer the same stunning panoramic views of Falmouth Bay, overlook the swimming pool and offer private access to the beach. The Admiral’s Suite is the most spacious room of the hotel. Located on the first floor of the hotel, it boasts views of Falmouth Bay and the beach from the private balcony. Away from our hotel, this stunning island has so much more to offer. If you are looking for a livelier beach, Pigeon Point Beach is a short drive away from our hotel. Part of the Antigua experience is the sunset-into-the-night party at Shirley Heights which is just 10 minutes’ drive from our hotel. It is an 18th-century fort that commands fabulous views, and on Sundays, a massive barbeque attracts the yacht-set and locals alike where we can join the fun. A visit to a Caribbean Island would be incomplete without a catamaran cruise. The circumnavigation tour takes travellers on a 60 mile adventure around Antigua’s amazing coastline with a chance to snorkel and swim in the open waters. Why not try your hand at some traditional Caribbean cooking with classes at Nicole’s Table? Once dishes are cooked they are served on the veranda overlooking St John’s Harbour. If you want a nice quiet relaxing holiday, this is the one for you. You can lay in the sun all day, every day if you want, but there is also plenty to see and do if you want to keep busy! Our cosy hotel is beautifully located on the shores of Falmouth Harbour. The location allows convenient access to popular points of interest such as Nelson’s Dockyard and Shirley Heights. A short walk from the hotel we will find a small supermarket, as well as a restaurant serving the freshest fish. *Please note: The Catamaran Hotel does not have a lift, and is therefore not ideal for people with walking difficulties. Swimming pool with loungers and umbrellas, waterfront restaurant for breakfast and dinner, small bar and free Wi-Fi. Although all our rooms differ in size and décor, all rooms offer the same facilities. Comfortable rooms feature air-conditioning, kitchenette, fridge, kettle, satellite TV, safe, hairdryer, telephone and Wi-Fi. 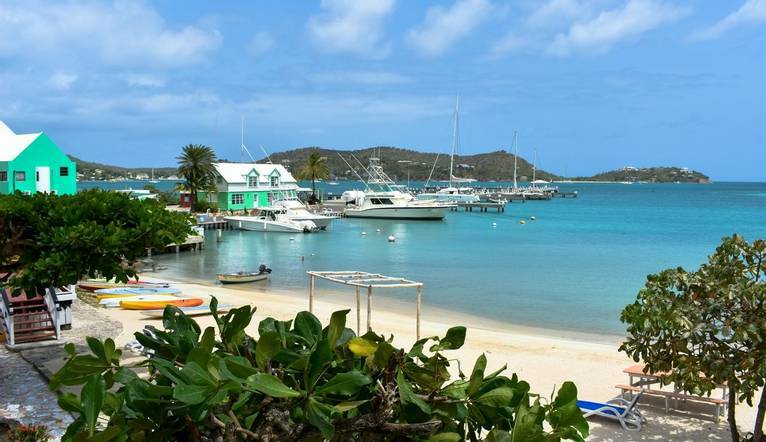 Transfer time from Antigua Airport to The Catamaran Hotel is approximately 25-30 minutes. You may wish to take an optional excursion during the course of your stay. Full details will be given at the Information Meeting. All tours should be paid for in USD or ECD. Credit cards are accepted. The exact amount will be given at your Information Meeting. Your Tour Leader will help arrange these for you but may not necessarily accompany you. There is often confusion on the question of gratuities, since it frequently depends on the type of holiday, location and, of course, your attitude towards tipping, as to what is normally expected. In order to give you a rough idea, we have given appropriate guidance below. Your Tour Leader will be on hand to offer advice or suggestions if required but gratuities are offered entirely at the sole discretion of the individual. We suggest a group collection to cover drivers, porters and hotel staff of £20.00 per week, (or the equivalent amount in local currency). Your Tour Leader will collect this on your behalf and distribute it accordingly, thus relieving you of the burden of who, when and how much to tip. The tipping of housekeeping will be left to your individual discretion (a small amount left in your room on departure should cover this and would be much appreciated). As is customary, ‘the hat’ will be passed around for the driver and guide on all optional excursions. For any meals that are not included in your itinerary, or taxi fares, your Tour Leader can advise of an appropriate add on.